Climate shocks intensify food insecurity, according to the latest Global Report on Food Crises 2018, published by the Food Security Information Network. 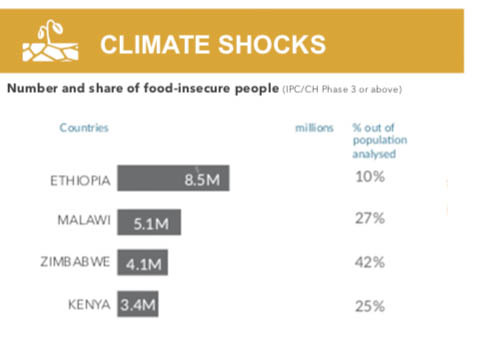 In 2017, climate-related shocks were the main drivers of food insecurity in 23 of the 51 countries and territories in the report. “Countries that are prone to drought, cyclones, hurricanes and flooding tend to have successive low harvests because poor rural households have limited access to agricultural inputs such as irrigation, fertilizers and improved seeds or to credit, and they lack the capacity to mitigate the impacts of successive climate shocks. In parts of the Horn of Africa, recurring drought decimated livestock herds and severely affected cropping seasons in 2017, sharply reducing crop production particularly in Somalia, eastern Kenya and south-eastern Ethiopia.